This is a knitter’s morning. The sky is dark and gloomy, sending down intermittent but steady showers of rain, and the air is cold. Not cold by the standards of anyone in the part of the country getting slammed with winter storms, but cold by the standards of those of us in a metropolitan area whose temperatures hovered in the low seventies all last week. I am snuggled on the couch with the dog, and any minute now, the water will boil for coffee. 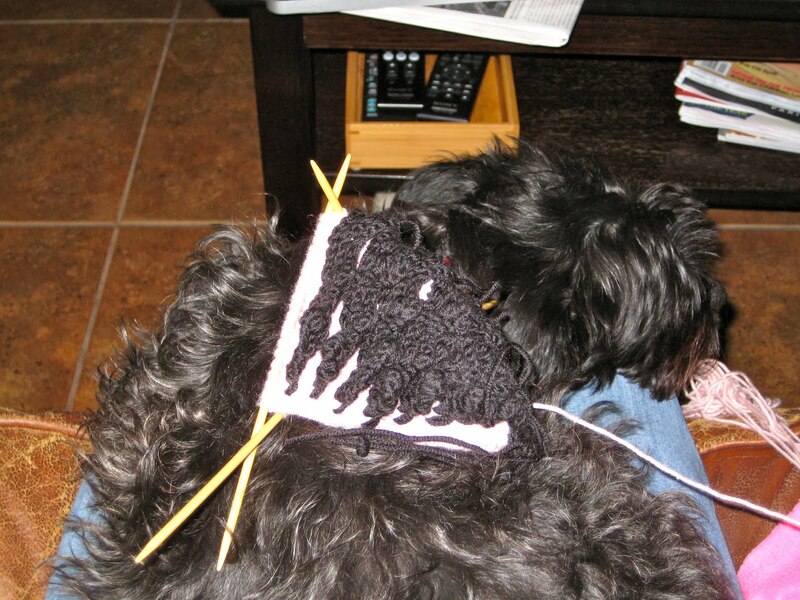 Of course, my knitting is out too. I very intentionally went stash diving for my last two projects: combine a stash tote that won’t stay closed with paying tuition and it’s no wonder I’m feeling the need to be frugal. Unintentionally, I also ended up knitting patterns I’ve done before. 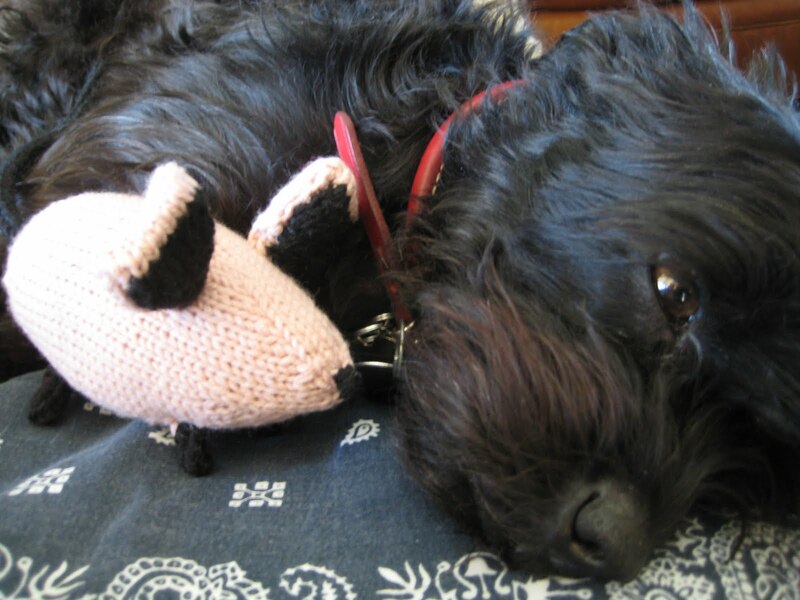 Already off the needles is a Mousie (modeled with Stella, who was too simply exhausted to protest). This is my fourth Mousie to date (the most famous being my own international traveler Mousie), and I can’t say enough about the pattern. Ysolda is known for her all-in-one knits, and she extends this philosophy to her toys as well as sweaters. Mousie’s turnip-y body extends right out of the tail, and then the feet are knitted right on to the body (which makes for some stares if you do that part on the bus), ditto the ears, and by the time you’re that far, the whole little thing is so cute, even I am not put off by having to seam up the sides of the ears. Still on the needles, inching towards completion, is a hedgie to match Mousie. The hedgie (Smith) is another Ysolda pattern, so it follows her all-one-piece ethos, but as the designer herself said, anything with spikes is a little fiddly to knit. Even the second time around, this is true. I knit my first Smith a year ago, to accompany a sweater for a little cousin. Remembering the gist of the pattern has come in handy while knitting spikes, but it didn’t save me from committing two classic beginner’s mistakes: running out of the house without my instructions for the disappearing cast-on that begins the body one morning, and then running out of the house without the larger size needles needed for the spikes the next morning. I would be tempted to lay the hedgie aside in favor of a little spike-free knitting, but the duo is a baby-big sister gift pair for one of the children’s librarians at work, and today begins her last week at work before the arrival of the little one. Nothing for it but to keep knitting with an eye on some nice, flat, spine-free lace.